In part 1 of this 3 part series we looked at how to develop a sponsorship proposal that fits with the sponsor's marketing plan. Today, in part 2, we're going to look at how to deliver exceptional value in your sponsorship proposal by illustrating why your program is the very best marketing option for a potential sponsor. To work along with the exercises in this article download the sponsorship value worksheet. 1 - Demonstrate a return on investment for your sponsor Return on investment (ROI) is a fairly simple concept on the surface. If I spend $1 with you I expect to get my $1 back plus a % return in profit. The ROI sweet spot is the point where your target audience's expectations intersect with the sponsor's objectives leveraging your unique marketing initiatives. This list is by no means exhaustive but it's a start in the right direction. Let's say you run a 5 day cycling tour; why do people participate and what are their expectations? Perhaps it's for the sense of community, riding along with their peers and enjoying the outdoors (gratification) while improving their fitness. Ask yourself: What are my target audience's expectations? 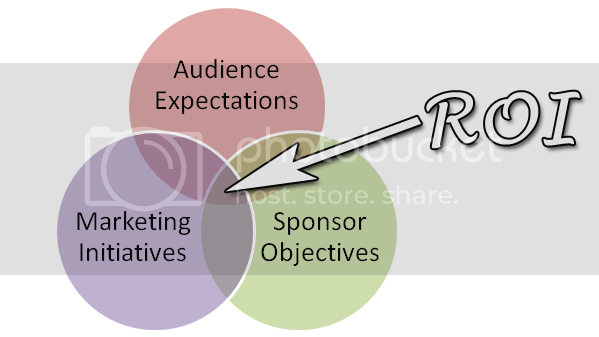 Now that we understand what our target audience's expectations are, we can look at our sponsor's objectives. Our goal is to therefore connect the target audience's expectations (community, gratification, improvement) with the sponsor's objectives listed above. We're going to examine your unique marketing initiatives in the next section. 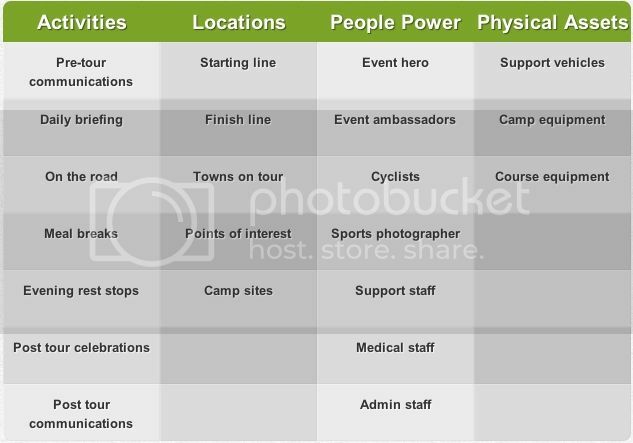 - Activities – what activities make up your sponsorship opportunity? - Locations – in what locations do you operate? - People Power – who are the members of your team? - Physical Assets – what physical assets do you have at your disposal? With our stock-take completed, target audience expectations and sponsor objectives defined it's now time to develop our unique marketing initiatives. Note that I'm not including assets like your website or social media accounts. The assumption is that you will use these where appropriate for promotional purposes. Your unique marketing initiatives don't include logos on vehicles, venue signage or any of the standard promotional tactics. While they should be included in your sponsorship proposal as a matter of course, there's nothing unique here so we won't be discussing them. We want to focus on those elements of your sponsorship program that can't be replicated by traditional marketing activities like signage, media advertising and mail outs etc. We're interested in the essence of your sponsorship opportunity that engages with your audience through meaningful and positive experiences; activities that your sponsor can leverage to really connect with your audience. Using our cycling tour as an example once again, I'm going to come up with 5 unique marketing initiatives. Pre-event and during the evenings of the tour the event hero will provide tips on how to improve their riding skills and share stories from the professional cycling world. Pre-event these would be delivered as a video blog using the sponsor's products. Each evening the riders will also have the opportunity to have their photo taken with the hero on the sponsor's digital cameras. These can then be uploaded, tagged and shared via social media and a copy provided to the cyclist at the end of the tour. Each participant will be able to use their race number as a discount coupon to purchase products from the sponsor's online shop. During the course of the tour a professional sports photographer will be employed to take professional actions shots of the cyclists using the sponsor's equipment. See, that wasn't so hard. Now we have 5 unique marketing initiatives we can take to our prospective sponsor. Now that we've got our unique marketing initiatives sorted, it's time to look at ways to highlight the competitive advantages of your sponsorship program, and build a business case around why your sponsorship program is the logical choice of the available marketing options. Where sponsorship has a huge advantage over other forms or marketing and promotion is relevance. Your target audience is already actively engaged with your sponsorship program (and your sponsor if you've done your home work). Ask yourself: What are the reach, frequency and relevance of my sponsorship program? There's a generally excepted rule in sales that you must "touch" a potential customer a number of times before they convert into a qualified sales lead. What does this all mean? Well, when you consider that numerous sales touches are required to make a sale, it's fair to say that frequency is more important than reach in this context. 4 sales touches to 250 people is more effective that 1 sales touch to 1,000 people. The number of impressions is the same (1,000) but you've created a deeper connection in the first example and moved closer to a sale. Why is it important? What makes sponsorship so special it that it's primarily driven by the emotion and passion of the audience. While the overall reach may be lower than mass (interruption style) media, sponsorship provides a targeted audience which businesses can engage with in unique and interesting ways in a fairly short period of time. Sponsorship - trade reach for frequency and provide a greater return on investment. Ask yourself: What type and how many quality sales touches can I provide as part of my sponsorship program? Social media is a big deal. It's changing the way people interact with each other and share information. If your target audience is using social media then you need to carve out your niche, build your fan base and contribute to the conversation. The ultimate aim of any sponsorship proposal is to convince a sponsor to invest in your program by clearly illustrating why it's the very best marketing option available to them.